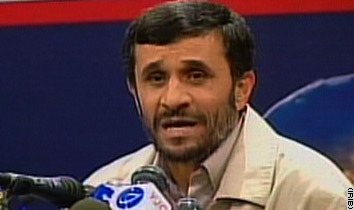 TEHRAN, Iran (CNN) -- Iranian President Mahmoud Ahmadinejad said Tuesday his country expects its uranium enrichment program to be ready by February to meet Iran's nuclear fuel needs, the national news service IRNA reported. "We will commission some 3,000 centrifuges by this year end. We are determined to master fuel cycle, and commission some 60,000 centrifuges to meet our demands," the president said at a news conference closed to foreign reporters. "Today the Iranian nation possesses the full nuclear fuel cycle and time is completely running in our favor in terms of diplomacy." Ahmadinejad said Iran hopes to celebrate its nuclear success during the "Ten-Day Dawn" festivities at the beginning of February, which mark the country's victory in the Islamic Revolution, the Islamic Republic News Agency reported. "This year's Ten-Day Dawn period will mark the Iranian nation's success in mastering fuel cycle as well as its achievements in other fields," the president said. "I will soon send a message to the American people. The message is in the stage of preparation." I just got a few comments to that. Is it not just swell with a supplier of unlimited nuclear materials in the Middle East? Al-Qaeda et al are already dancing their dances of victory. Hopefully somebody decides that 10 days of dawn party is to be followed by one permanent sunset. They want fully nuclear? Then by all means - let them have it. Two years passed, I still remembered the scene of fighting against wolves with friends, sharing fruit which was got by our mabinogi gold around a fire, fishing in a clean pond. Players will have five seconds freezed to make their own preparation, win or lose; it depends on your own cheap mabinogi. Here is some mabinogi money I took months ago; I was the guy wielding a thick sword. But, we can use some mabinogi online gold to edit some dates in the setup menu to change the clothes we wear. As a kind of fantastic online game, I think Mabinogi is more similar to comic and need to buy mabinogi gold. Do you know that the mabinogi gold, and do you want to know? In the game many palyers need the mabinogi money to up their levels. so they often search where can buy the cheap mabinogi, I think our website is your choice. Many friends told me that in here can buy mabinogi gold, and you will also practice your online games skills. So i hope more and more players come here to buy the mabinogi online gold. What wil the response to our ridicule be? Do Muslims need to integrate more?